Managed by the Orchard Management Committee and maintained by the Green Gym, Chipping Norton Community Orchard is open to the public at all times, but particularly on the two Sundays when we hold a Blossom Day or Apple Day there. When upcoming, these events are publicised in Latest News posts. Blossom Day is generally held in May and Apple Day, usually in October. The orchard is sited on half an acre of land which is part of the Regulated Pasture managed by the Field Reeves on behalf of the town. For its exact location, and parking arrangements, see below. Most of the trees were planted in 2010, fruits represented being apple (including a crab), plum, gages, pear, mulberry and quince – with sloes, nuts and rose hips in the hedge. All the orchard trees are identified by variety, plus first recorded place and date of origin. Pick Your Own fruit for free: we place notices on trees and bushes where the fruit is ready to pick. Those luscious-looking blackcurrants or bright red apples may actually be really under-ripe, so please be patient and wait for the “Pick Me Now” notice to appear before you pick some to take home. 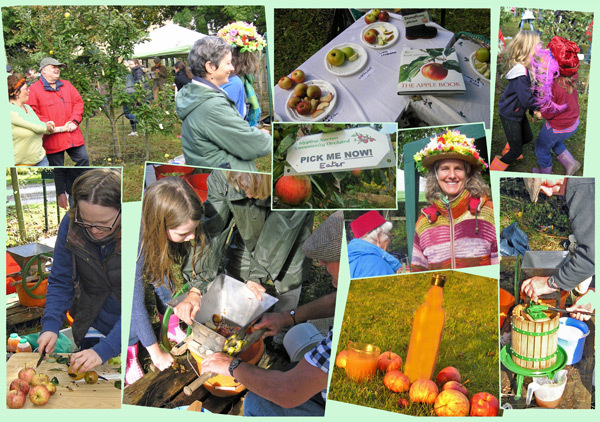 Apple Days are a popular annual October event, where the free refreshments feature orchard fruits. Visitors can bring their own apples for pressing and take home the juice. The ever-popular childrens’ games are topped by the wassailing when, with lots of noise, singing and dancing, the trees are blessed for next year’s harvest. In February 2010 a 10 year lease was granted to the Green Gym and was extended from August 2012 to cover 10 years from that date. Transition Chipping Norton were involved from the outset, providing money and expertise. We work there as part of our normal programme, tending the trees, keeping them free of weeds and planting new trees. Since February 2010 the ground has been cleared of brambles and nettles, the shed (known as the donkey shed) moved to the top of the site and a water tank installed. Four palette compost heaps, seats and benches and a small notice board are in place. Almost 30 fruit trees were planted in October 2010, followed by an edible hedgerow in the November. Planting the orchard in October 2010. Left, a ceremonial planting supervised by the Chairman of the Field Reeves. The following Spring, 2011, saw a bed of black and red currants installed; and later a row of rhubarb crowns in the wetter area. The trees are all protected with tree guards and grease bands, and are well mulched. Each fruit tree is named with a robust slate label. Since an initial scything course in June 2012, the orchard has been hand-mown by trained members of Green Gym, using the orchard’s own scythes. The fruit trees are mostly 2008 grafts, with the three most local being two years younger. A catshead codling apple was planted in December 2012, and a memorial crab apple in October 2013. Sadly Following the very wet winter of 2013-14, five trees died and had to be replaced, by varieties including the acclaimed Avalon plum, similar to the Victoria. Other fruit and vegetables have been and will be added to enable the site to be as productive as possible. There is rhubarb, while soft fruits include red and black currants and gooseberries, and the boysenberries planted in December 2014. 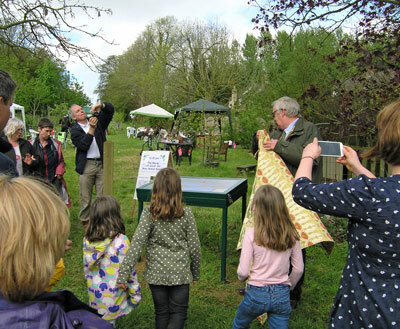 A Notice Board, funded by a grant from the Cooperative Society, and designed by pupils of Chipping Norton School, was unveiled by the Mayor on Blossom Day, April 2014. Site preparations in May 2010, music-making on Apple Day in 2012, and our then dream for the future, which is now starting to become a reality. The lease on the orchard is now for 10 years from August 2012, and we plan to continue nurturing the fruit trees, hedge and soft fruit so that the general public can come and pick and use the harvest. We hope to encourage the use and preserving of the fruit by liaising with schools and the Women’s Institute to educate young people in these arts. 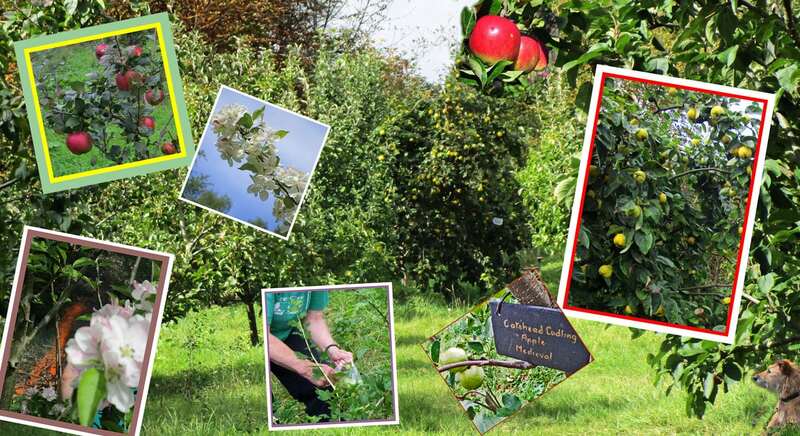 The support of the Town Council and Field Reeves is an important encouragement to the voluntary groups concerned – Green Gym, TCN and the Orchard Group – and lends assurance that the Community Orchard will continue to grow and flourish representing an important example of community voluntary effort. The orchard is off the Worcester Road (A44), near the Cemetery (OX7 5XW). Turn up the tree-lined avenue marked ‘Elmsfield Farm’ next to the Cemetery. Or walk a few yards across the Common, from the kissing gate at the bottom of the slope in the Recreation Ground, down to the foot bridge (FB on the map below) and up the field on the other side. When attending an Apple Day or Blossom Day Festival please come on foot if possible or use the small car park available on the day only, at the junction of the Elmsfield Farm drive and the A44. When visiting on other days, restricted parking is available at the far end of the drive, past the orchard entrance, on the right. There is also vehicle access along the “Elmsfield and Primsdown Industrial Estates” road. Follow this almost to its end; where it crosses the footpath to Salford, opposite a metal field gate by a metal kissing gate the (gateless) footpath leads downhill to the top gate of the orchard. At this point there is roadside parking for a few cars.